I never visited Disney World as a kid, which was fine by me. Growing up, I always thought the happiest place on earth was my grandparents' house. For years I've heard others sing the praises of this wonderful world called Disney, but I've never really had the urge to visit myself. I've especially never had the urge to take my 3 small children. I don't even like taking all 3 of them to Target. 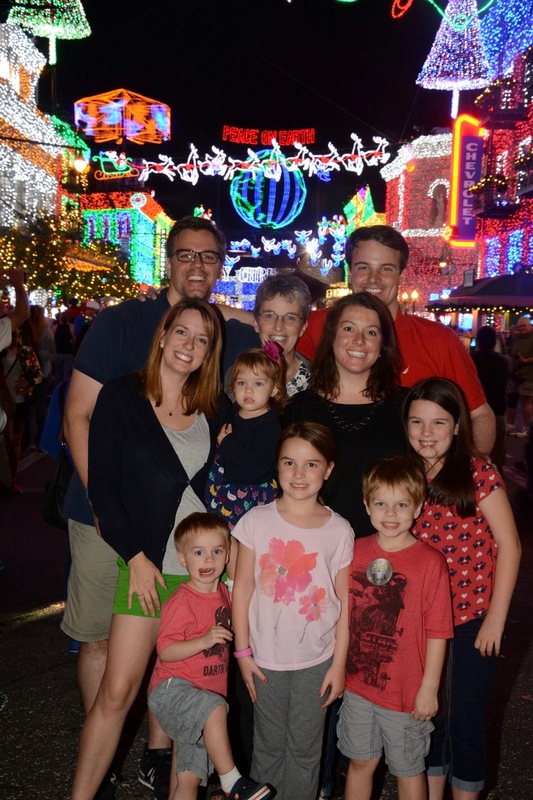 However, this year was my mother-in-law's 60th birthday and my brother-in-law came up with the grand idea of celebrating all together in Disney World. His family had been before and he promised to plan the whole thing, so that, plus the fact that there would be some extra hands to help out if we needed it left me feeling hopeful that we might actually be able to pull this trip off. It might even be fun! Besides, if something went wrong we could totally blame it on Uncle Adam. 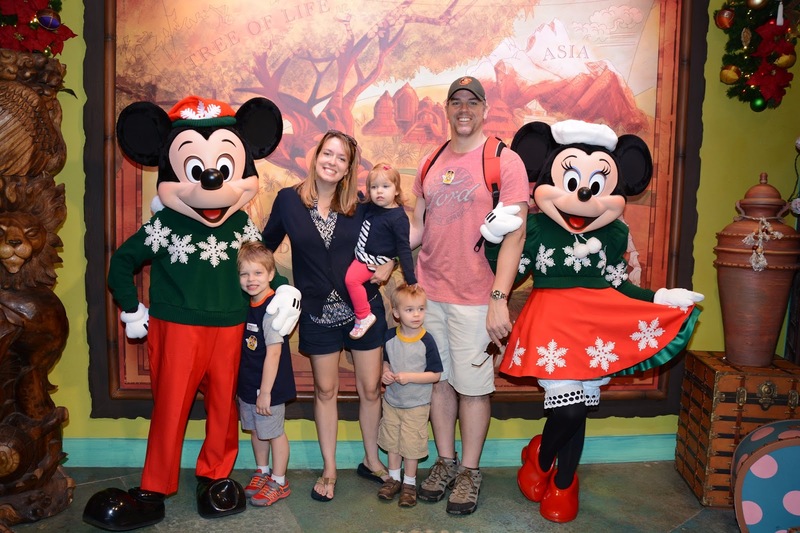 The kids were excited when we told them we were going to Disney World, but I think they were even more excited that we were going with their cousins. They are completely obsessed with their big cousins. I think we could go anywhere and they would be excited as long as their cousins were going. Hey kids, today we're going to the city dump...WITH MEREDITH AND CLAIRE!! YAY!!! After months of eager anticipation, the day finally arrived. We packed our bags, barely made our flight and headed down to sunny Florida. I can sum up our trip with two photos. There was a lot of other stuff in between, but basically, we had so much fun we had to come home and sleep for two days to recover. Right from the start I was blown away by the enormity of it all. The place is so massive that we could have stayed for a month and still not have seen everything. The Walt Disney World Resort is the size of the city of San Francisco and the population is probably the same too, except in San Francisco everyone is spread out around the city and at Disney everyone is in line to see Anna and Elsa. More than anything I was in awe of all the painstaking attention to detail. From the food to the decor to the music and more, nothing was overlooked. They even created snow over the Christmas parade on Main Street and, in addition to the festive music and lights, the floats piped out holiday scents as they drove by (peppermint, evergreen and gingerbread!). 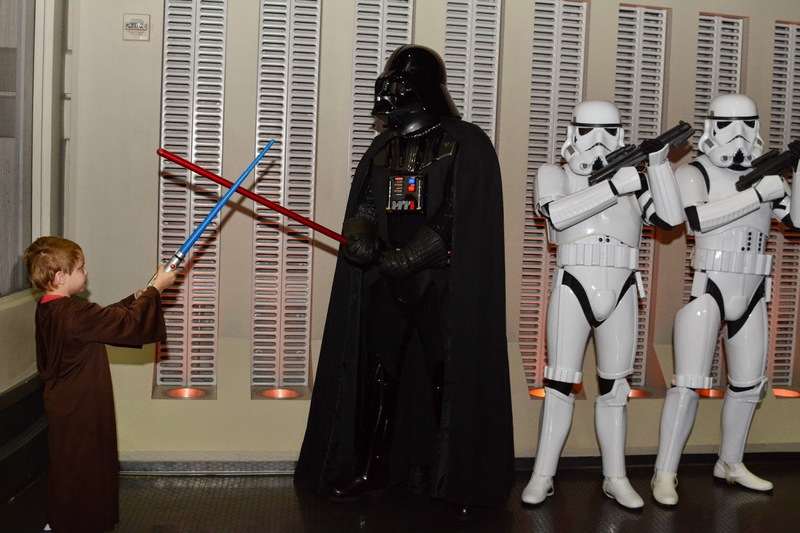 At each ride, restaurant or resort, the employees or "cast members" were dressed in full costume to match the theme of the attraction. At Epcot's World Showcase, I was gleefully surprised to discover that the cast members in each country were actually from the actual country, with 11 countries represented in all. I even asked a French girl working at a French bakery in France how she found the job. "Oui! I google it!" she answered very Frenchly. I can definitely see why people return again and again. It's not so much about this ride or that character, it's the whole experience combining to create the feeling that you really are in whole new world. At one point I found myself laughing out loud as we walked through Fantasyland because I felt like I was actually walking through an animated movie. 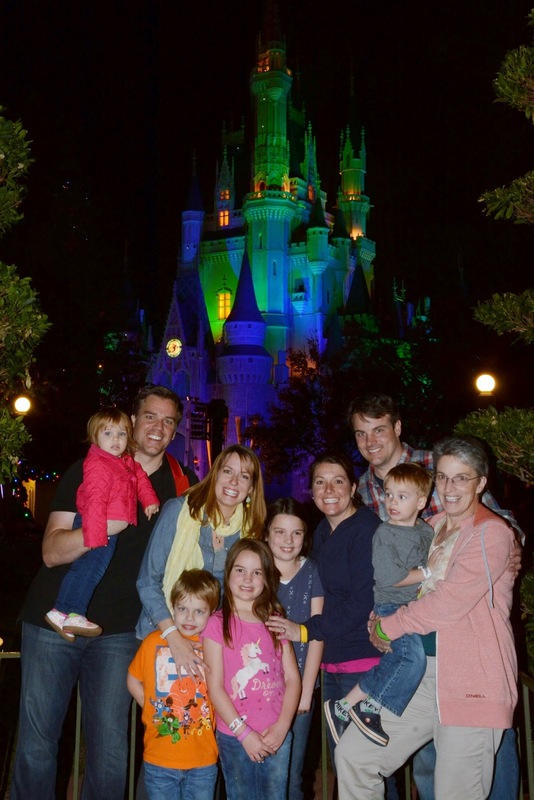 If I ever return to Disney, I will not be bringing a 20-month-old. The one I have broke me. Who knew my adorable little toddler was capable of afflicting such complete and utter exhaustion on her caregivers? Oh wait, I did. My bad. First of all, she chose this trip to all of a sudden decide that she hates the stroller with a violent passion. She only wanted to be held by me, except when she didn't want to be held and would ask repeatedly to "walk! walk! walk!" Except walk was really her secret code word for "run away as fast as I can while you chase me through a crowd of people." Forget Mickey and Minnie, her favorite thing about Disney was finding new ways to run away from Mommy. 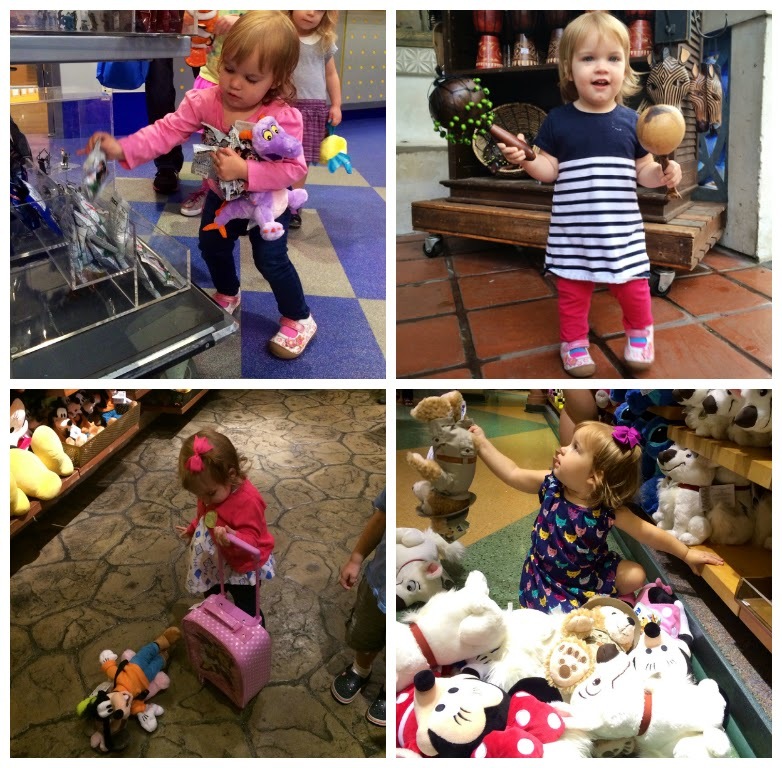 Usually, she would run into a store, which brings us to her second favorite thing about Disney: shopping. Every time she saw a gift shop she would flail and scream and thrust her tiny body in the store's general direction, wanting to get her chubby fingers on whatever shiny thing happened to be on display in the window. Every store sighting brought on another Disney-induced seizure, so thank you, Disney, for providing these essential shopping experiences every 50 feet or so because who doesn't need 302 different pairs of Mickey Mouse ears? We avoided the shops for the most part, but to Elise's delight, many attractions had gift shops built right in! Hooray! She immediately grabbed all the treasures her little arms could hold and would then weep as if they were her most precious possessions when we had to leave them behind. Bonus Tip: At Disney there is more screaming in the gift shops than on the rides. At one point we bought her a stuffed Minnie Mouse in hopes of placating her. About 20 minutes later she flung poor Minnie overboard on the Pirates of the Caribbean and we all watched her float out to sea. Elise was not the slightest bit distraught. As we exited through the Pirates of the Caribbean gift shop she promptly grabbed herself a handful of jeweled necklaces and bolted out the door as fast as her little legs could go. I think she would have been just as happy at Target. If you ask Jack he will tell you that his favorite part of Disney were the roller coasters. Or the day he spent as a Jedi in training. But I think that's just a cover. 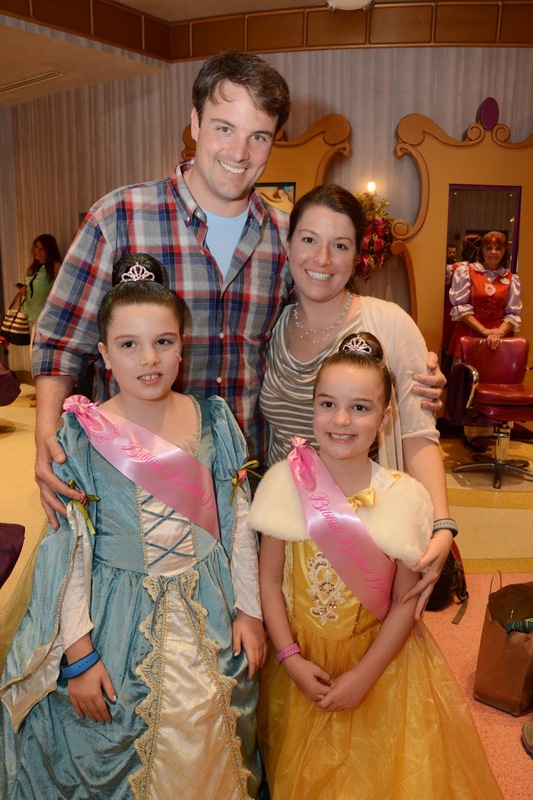 He will never admit it, but I think he liked meeting the princesses the very best of all. 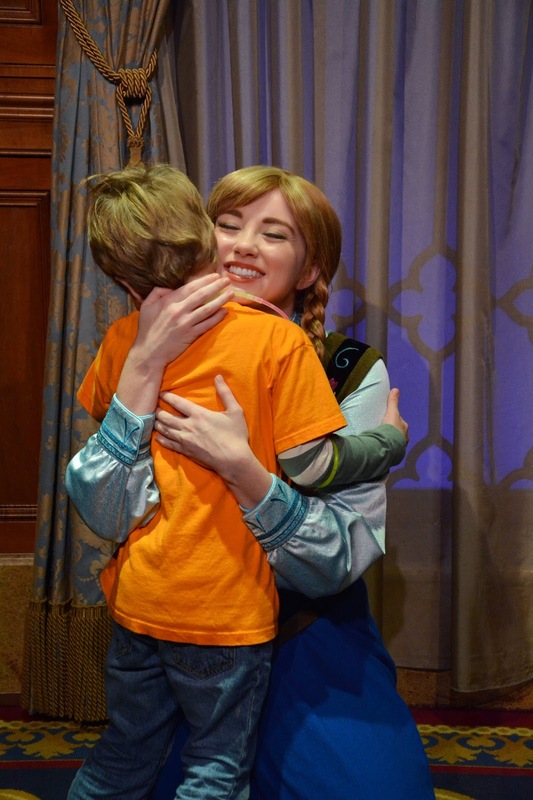 At first, he begrudgingly stood in line with his cousins to meet Anna and Elsa, announcing all the while that he did NOT like princesses and he was only going to get their autographs and he was ABSOLUTELY NOT going to give them hugs. 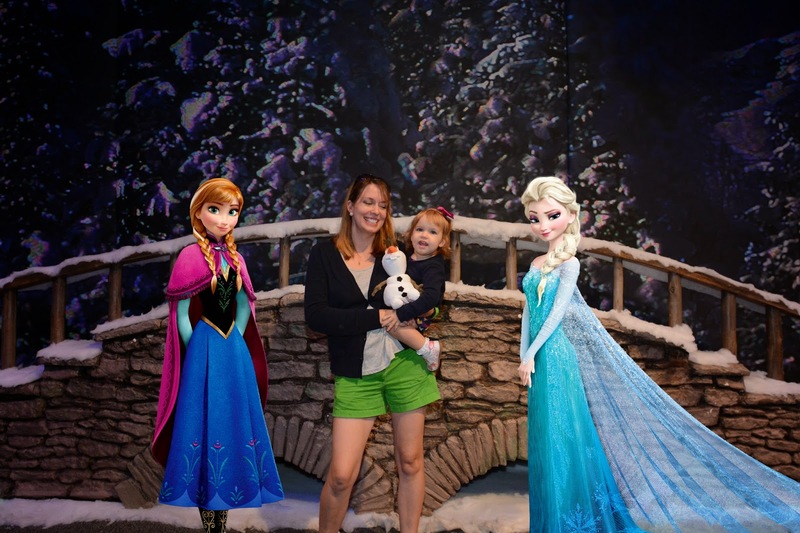 Then, as the line moved forward and we approached the entrance, we were ushered into the room with the actual Frozen princesses. Jack's eyes widened and the goofiest grin spread across his face. 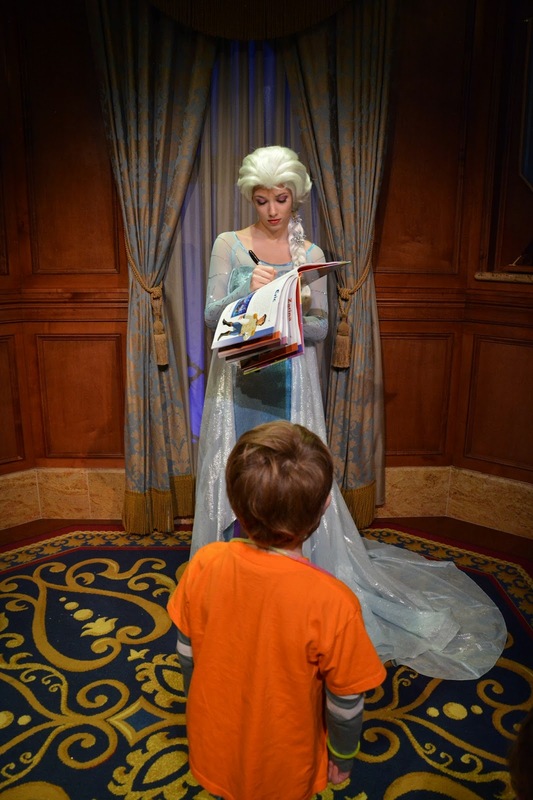 He stared at Elsa completely starstruck. He even got to chat with Anna for a minute. Rather, Anna chatted and he just nodded and giggled. As we were walking out I asked him what she told him. "That's private, Mommy. It's between me and Anna," he answered. 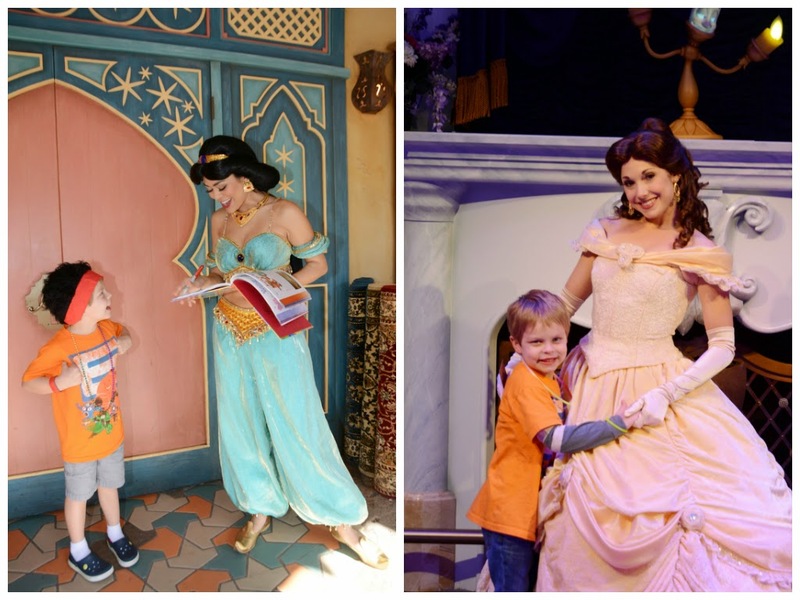 After that he was more than willing to wait in line to meet Jasmine. By the time we met Belle, she practically had to pry him off her waist. Finally, when he found out he would be visiting Cinderella at her castle he decided to tag along with his cousins at the Bibbity Bobbity Boutique. 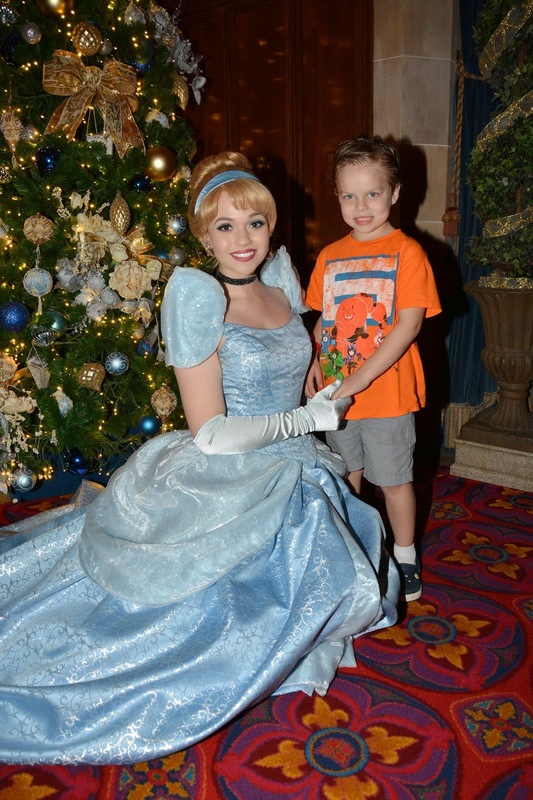 And he asked the fairy godmother to give him "Bruce Wayne hair." I think my 5-year-old is twitterpated. Tip 3) Be aware that even though you are on vacation, your 3-year-old will still act like a 3-year-old. When Henry was a baby he ate everything, everything. Dead bugs, flowers, several varieties of poop; if he was curious about it, he ate it. Thankfully he has outgrown that stage. Sort of. Now he just licks everything. Unfortunately he brought this new habit with him on vacation. 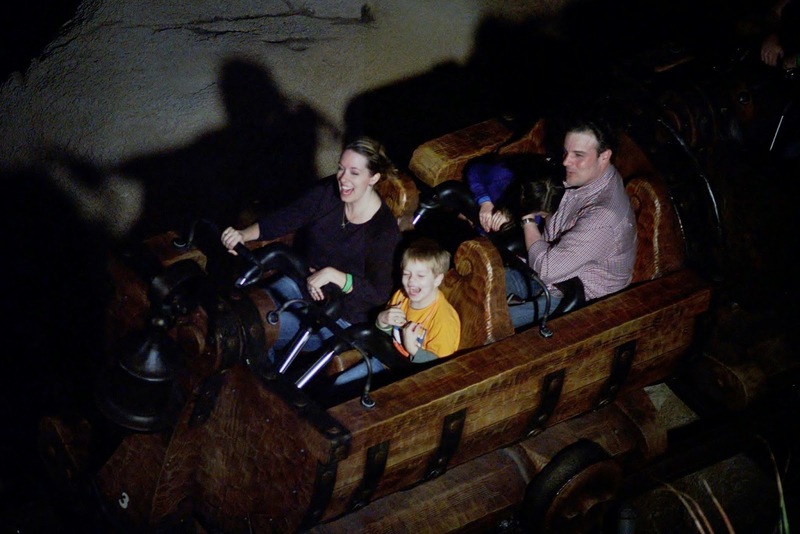 Our 3-year-old licked his way through Disney World, which was great when he was licking Mickey-shaped ice cream, but not so great when he was licking, well, other things. He was especially fond of licking all the different chains and bars that guided people through the queue before a ride. We had to take turns as official Line Licker Lookout to push Henry's face away from all those tempting metal chains. I'm sure Henry will read this one day and die of embarrassment, but I assure you it was equally embarrassing to have the TSA agent at the crowded airport ask, "Excuse me, whose child is this licking our glass partition??" Of course, Animal Kingdom was his favorite park and the safari was his favorite attraction. 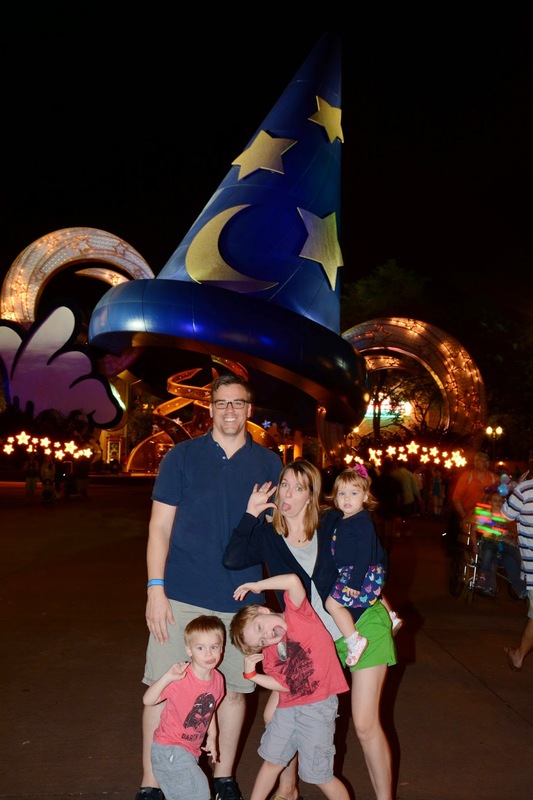 Believe it or not, out of us all, I think the Disney magic may have had the biggest effect on my husband. Before this trip, John had seen approximately 3 Disney movies in his life. He is rarely on time and he has NEVER been early for anything ever. Yet, each morning he woke up like Buzz Lightyear on a mission, determined to get us to the park before it even opened. It was like he thought there was some sort of competition to see who could have the most fun and he was going to lead us to victory! To Epcot...and beyond!! 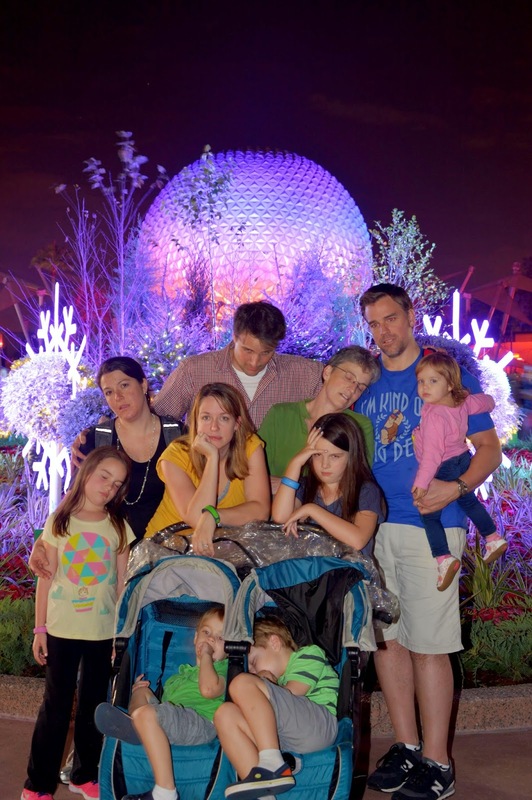 One day we got to Magic Kingdom at 7am. I think the last time he was up that early was for the birth of our second child. Once in the park he wanted to see it all and do it all, and he did! He rode Space Mountain, made a beeline for the bratwurst in Germany and dragged our 5-year-old with him on the Tower of Terror. Watching him participate in the Frozen Sing-a-long made me want to marry him all over again right there in the middle of Hollywood Studios. After seeing Beauty and the Beast's Gaston in action, John thought he was so funny he bought a Gaston t-shirt....or so he thought. We almost didn't have the heart to tell him it was actually Hercules. Almost. "What do you mean it's not Gaston?! Hercules isn't even a Disney character!" As for me, I'd love to come back again someday. Someday, when my children can all walk themselves around the park and I don't have to constantly worry about one of them shoplifting or licking a character during a meet and greet. All in all, I had a wonderful time with my family, but it was definitely the most exhausting vacation of my life. The moment we got home I melted into a big puddle on my bed. And Elise did manage to make it home with an Olaf. We went when our kids were 4 and 6 and it wasn't especially fun. They were scared of all the rides and just wanted to get autographs. We took them a second time 10 years later at ages 14 and 16 and had the best time ever! We were up early to get to the parks when they opened and since no naps are required with teens we stayed each night until the parks closed. And! They rode everything we wanted to ride!